and, as all reflux-friendly recipes, very low in fat! This is a very indulgent (it’s low in fat, but packed with sugar, so not for every day!) cake that allows even reflux* sufferers to enjoy delicious cake without fear of nasty after-effects. That’s because all we’re using in this recipe is lemon rind, no juice, so you get the WOW-factor of the zesty lemon flavour, without any of the nasty acid. This is only a slight variation on the basic ‘Three Ingredient Low-Fat Sponge Cake‘ and still just as easy to make. In a large bowl, whisk the eggs and sugar until the mixture more than doubles in size and becomes quite thick. This will take quite a few minutes. A good test is to make a dent or line on the surface with your finger or a spoon and see whether the shape holds. Just before it gets that thick, add in the very finely-grated zest of one lemon (you will need the second one for the icing) and keep whisking. Once it briefly holds its shape when you make a dent in the surface, it is ready for the next step. Sift the flour and fold it carefully into the egg, sugar and lemon mixture, taking great care to be gentle and not lose the air you have whisked into the eggs. Having prepared your cake tin as described under ‘equipment’, above, pour in the mixture and place the cake tin into a pre-heated oven at 170°C (fan) and leave it in for 25 minutes. Test with a cake skewer or wooden toothpick before removing it from the oven to ensure the cake is cooked (the skewer/toothpick should come away dry). Take it out of the oven and leave to cool in the tin for a little while before carefully removing from the tin and leaving to cool completely on a cooling rack if you have one. The cake often sags a little in the middle – this is perfectly normal and won’t affect the taste or texture. Once the cake has completely cooled, prepare the icing: Place the cream cheese, very finely-grated zest of the second lemon and half of the icing sugar in a large bowl. Using the electric whisk on the lowest setting at first, start combining the ingredients. Be careful as icing sugar tends to go everywhere! Once the ingredients are amalgamated, add the rest of the icing sugar and, again, start on a low setting until the ingredients are combined, then turn up to maximum speed and whisk for about half a minute. Carefully cut the cake in half so you have a top and bottom half. Spread approximately half of the icing onto the bottom half, then replace the top over it and finish off by spreading the remaining icing over the top. The icing will be quite runny at this point, so get the cake into the fridge as quickly as possible and, ideally, refrigerate overnight to allow the icing to go more solid. Tip: Once you have cut into the cake, make sure you cover it with clingfilm to ensure it doesn’t dry out, before returning it to the fridge – that’s assuming there is any left!! Gloriously simple, gloriously indulgent, gloriously good! This is my first reflux recipe* on here, but I promise it will be the first of many! In a large bowl, whisk the eggs and sugar until the mixture more than doubles in size and becomes quite thick. This will take quite a few minutes and a good test is to make a dent or line on the surface with your finger or a spoon and see whether the shape holds. At that point, it is ready for the next step. Sift the flour and fold it carefully into the egg mixture, taking great care to be gentle and not lose the air you have whisked into the eggs. Having prepared your cake tin as described under ‘equipment’, above, pour in the mixture and place the cake tin into a pre-heated oven at 170°C (fan) and leave it in for 20 minutes. Test with a cake skewer or wooden toothpick after 20 minutes to ensure the cake is cooked (the skewer/toothpick should come away dry). Take it out of the oven and leave to cool in the tin for a little while before carefully removing from the tin and leaving to cool completely on a cooling rack if you have one. After 2 long days of meetings, professional speaking engagements and travelling, I longed for a hearty brunch when I got home this morning, so I would feel ready to tackle the day ahead. Everything in this was shop-bought so it was really quick & easy to make. Place the 2 muffin halves on a plate, top each with a slice of black pudding, then place the smoked mackerel on top. 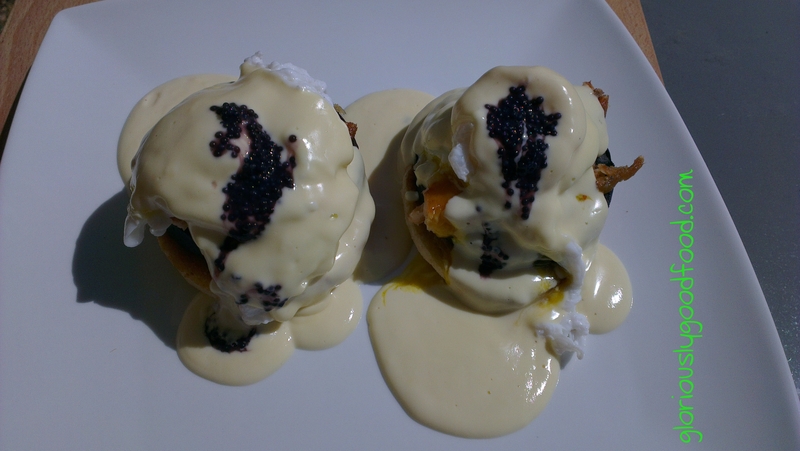 Top with the poached eggs (1 per muffin half), pour on the hollandaise sauce, sprinkle on some ‘caviar’. Done!